Join Dr. Lisa Ortigara Crego for a phenomenal two hours of weight loss strategies and self-hypnosis. Hypnosis groups are put together by demand. Lose weight permanently and be free from addictive eating. Dr. Lisa offers a natural way to lose weight through psychotherapy, hypnotherapy, and self-hypnosis. Keep it Simple and Natural: Recipes free of Sugar, Flour and Wheat! Combine clean eating with hypnotherapy to achieve permanent weight loss! This book is a must for all of us obsessing about food!! Mission Statement: To reach and help struggling food addicts release their obsession with food. The goal is to free the individual from their eating disorder, obesity, and low self-worth and move towards a closer connection with a Higher Source and people. This is done through spiritual recovery, psychotherapy, hypnosis, and self-hypnosis. Dr. Ortigara Crego earned her Doctorate in Addiction Psychology, is a Clinical Psychotherapist, Certified Eating Disorder Specialist, Certified Addiction Professional, and Licensed National Board Certified Clinical Hypnotherapist, who has worked in the weight loss industry for well over two decades. Dr. Lisa combines the use of self-hypnosis weight loss CD’s, hypnotherapy, and psychotherapy to create long term success in weight loss management and an understanding of food addiction. Her pioneering practice can help you reach your goals. Explore with her why you eat what you eat. Understand why food can cause your moods to swing, your cravings to soar, your weight to increase, your self-esteem to plummet, and your fatigue to rage. Dr. Lisa offers support that is as close as a click of the mouse! She offers stimulating hypnosis products and psychotherapy that can help make your journey to your ideal weight more pleasant and smooth. She offers you a breath of fresh air: a lifestyle, not a diet! The doctor received her undergraduate degree from De Paul University in Chicago, Illinois in Political Science, a graduate degree from Barry University in Miami Shores, Florida in Social Work with the emphasis on Mental Health, and a Doctorate degree in Addiction Psychology from Capella University in Minneapolis, Minnesota. Dr. Ortigara Crego contributed several chapters in The Encyclopedia of Obesity, published by Sage Publishing. Her dissertation, The Spiritual Recovery from Food Addiction, explores the experience of living with food addiction and transcending to spiritual recovery. 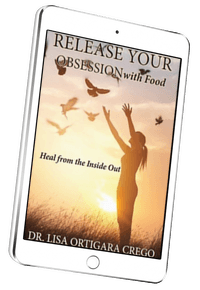 Dr. Lisa is currently writing a book on solutions to compulsive eating. Dr. Lisa Ortigara Crego stays current by studying the latest information available in her field and reading and participating in the most current studies available in the field of eating issues. She has a very successful private practice in South East Florida and is a Visiting Professor at DeVry University teaching Psychology and Critical Thinking.